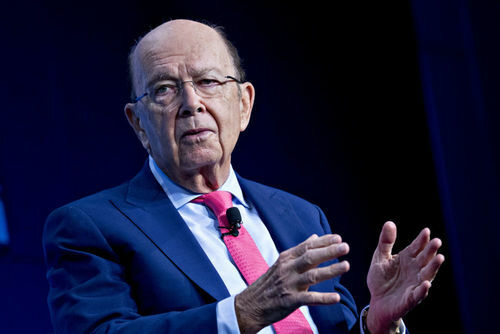 U.S. Commerce Secretary Wilbur Ross told China there was a need for "meaningful action" on key trade issues, according to a Commerce Department statement issued on Tuesday, Reuters reported. Ross also told Chinese officials in Beijing about U.S. businesses' concerns over forced technology transfers and data localisation requirements in China. The U.S. Commerce Department says Chinese officials are committed to further market openness and welcome U.S. firms’ participation. The White House says it's not seeking to overthrow North Korea's government after Pyongyang brands President Trump's comments on Kim Jong Un a declaration of war. Police arrest over 180 Obamacare repeal protesters on Capitol Hill, as a key Senator says she will vote against the bill that would replace the healthcare law. All aboard? Siemens and Alstom reportedly prepare to unveil a rail business tie-up, sending shares in rival Bombardier sharply lower. Tensions between the U.S. and North Korea reached a new level, as the country's foreign minister said President Trump's recent comments amount to a declaration of war, threatening to shoot down American aircraft outside North Korean airspace. The White House called the claim of a war declaration 'absurd'. 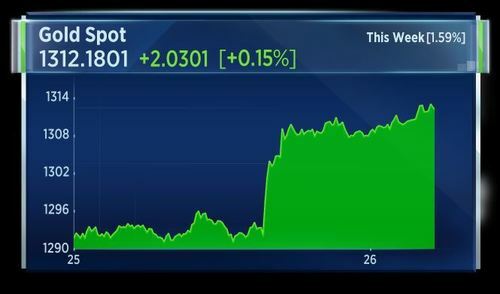 Safe haven assets made gains following the comments, with gold rising above the $1,300 level. As markets largely ignore politics, what should they worry about? Rising oil prices, Higher rates, Market levels or - You just can't ignore North Korea. Hit the link below to cast your vote. You can also have your say on Twitter using #TraderPoll. 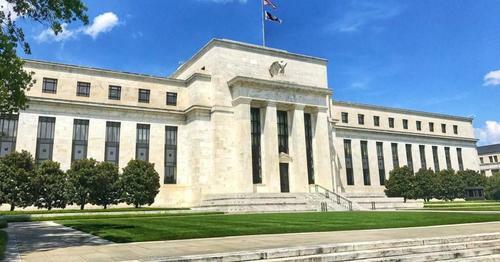 Tell us what you think: After largely ignoring politics, what should worry markets most? In this week's Trader Poll, we want to know what should worry markets most? Nestle confirms a mid-single digit 2020 organic growth target and set an underlying operating profit margin target of 17.5 percent to 18.5 percent. It had a margin of 16 percent in 2016. The company says it will continue building a strong position in emerging markets. 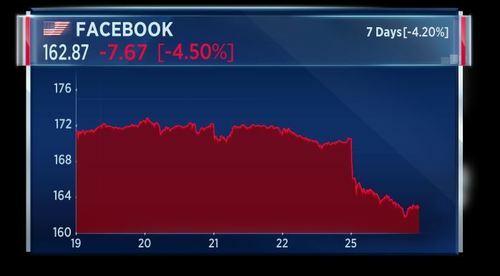 Shares in Facebook had their worst day since early November on Monday, falling 4.5 percent. The slide came following new revelations about how Russian operatives bought ads on the platform highlighting Black Lives Matter protests and other divisive issues during the U.S. presidential election. According to a source, Facebook will share more detail on the ads with Congressional investigators looking into Russian political interference. The SEC Chairman only learned about the 2016 hacking of its systems last month, according to Reuters. Jay Clayton had been on the job since May. Investigators are looking into suspicious trading that happened after hackers accessed financial data in the SEC's EDGAR system. Meanwhile, Deloitte revealed it suffered from a hack to their client data. The accounting firm said clients and authorities have been notified. Deloitte provided few details, saying only a small number of clients were affected. Trey Gowdy, Republican Chairman of the House Oversight Committee, asked the White House to explain the use of personal email accounts by senior officials. 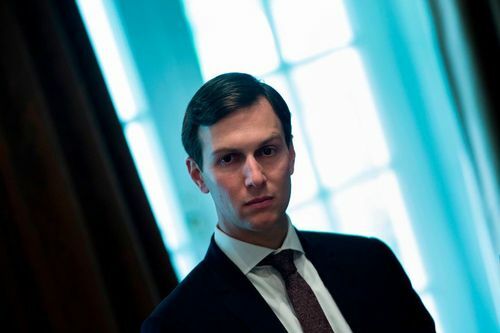 This follows revelations that President Trump's son-in-law Jared Kushner and other Trump officials used such accounts to conduct official business. The White House says all employees have been directed to use official email for government work. Jared Kushner and other Trump officials reportedly used such personal email accounts to conduct official business. Meanwhile, the latest attempt to repeal Obamacare is effectively dead, after Republican Senator Susan Collins said she will vote no. Two other Republicans already announced their opposition, meaning the bill won't have the votes to pass. Police arrested over 180 protesters who packed the Senate halls to express their support for keeping Obamacare in force. NBC's Capitol Hill Correspondent Kasie Hunt reports on the protests against the latest attempt to repeal Obamacare. London Mayor Sadiq Khan has asked Transport For London to meet Uber's CEO after the firm apologised for the "mistakes" it has made. In an open letter Dara Khosrowshahi said Uber must change, as it vowed to appeal the decision to strip its licence in the capital. Uber's 40,000 drivers will continue to operate until the appeals process is exhausted, which could take months. But the move could deliver a boost to rival rideshare apps and traditional cab companies alike. 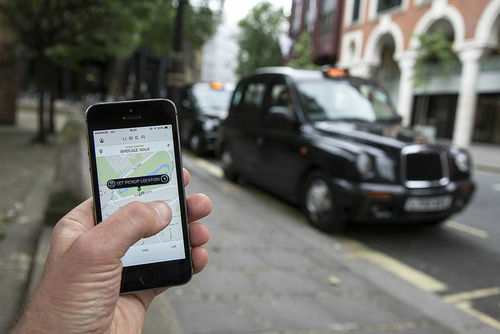 Public documents have revealed that Uber's closest US competitor, Lyft, has met repeatedly with TFL officials in a sign it is preparing to expand in London. Angela Merkel has begun the task of trying to build a coalition government after winning a fourth term as Chancellor. A 'Jamaica coalition' remains the most likely option, but talks could be tough, as the FDP's leader said his party wouldn't agree to such a tie-up "at any price". 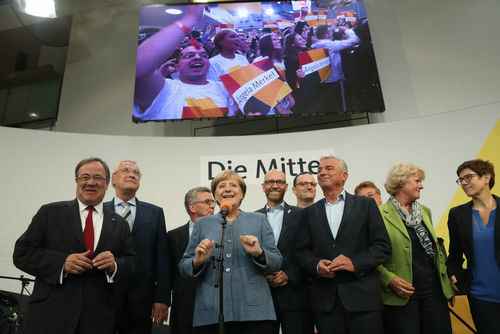 Merkel also kept the door open to a re-run of the Grand Coalition with the center-left SPD. Hurricane Maria has caused up to $85 billion in insured losses, according to catastrophe modeling firm AIR Worldwide. Maria has been the worst hurricane to hit Puerto Rico in over 70 years, causing extensive damage to property and infrastructure. 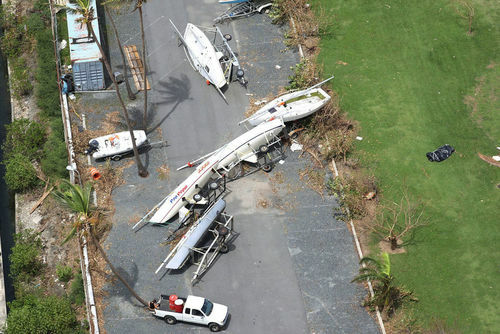 Sailboats lay capsized in Puerto Rico in the wake of Hurricane Maria. German August import prices are flat month on month, up 2.1 percent year on year. That compares with expectations of 0.1 percent and 2.1 percent growth. Thomas Cook has published its full pre-close trading update, saying its outlook for underlying EBIT is unchanged. Winter 2017/18 booked revenue is up 6 percent. The group has entered a strategic partnership to grow its own-brand hotel portfolio. Thomas Cook also announced that its chief financial officer Michael Healy is to retire Bill Scott is appointed as successor. Nestle says it will speed up share buybacks and pursue external growth opportunities, as the Swiss company pledges to improve margins and cut costs. The U.K.'s competition watchdog is training its sights on the price comparison industry. The CMA says it will set out ground rules for price comparison sites and says some websites are not working people's best interests. The watchdog plans to open a competition law investigation into how one comparison site sets up contracts with insurers. 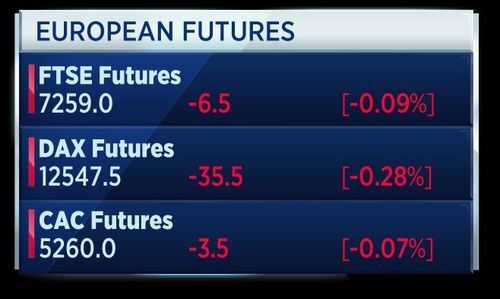 European futures indicate a lower open for markets this morning. Markets closed slightly higher at the end of yesterday's session. French September industrial confidence dips to 110 from 111 in August, according to INSEE. Service sector confidence rose to 108 from 107. The composite business confidence index is stable at 109, unchanged from August. 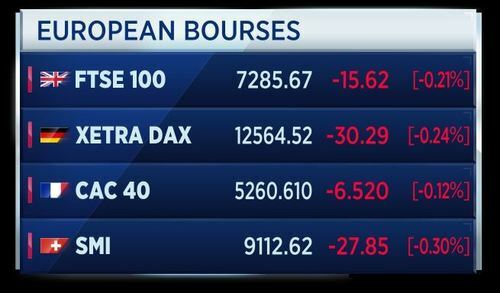 European markets are now open for trade and staying close to the flat line. 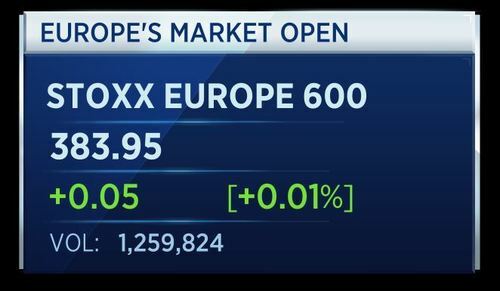 The Stoxx 600 closed 0.18 percent higher at the end of yesterday's session. 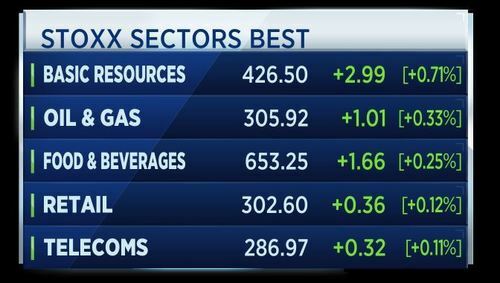 Basic resources and oil & gas are the biggest gainers at the start of the trading session. 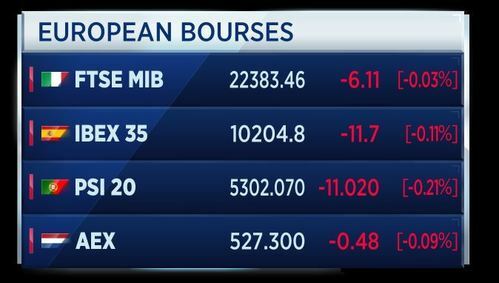 All the major European markets are lower at the start of Tuesday trade. 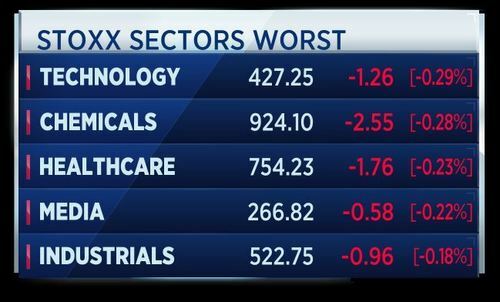 These are the main headlines following the market open. Not taking a bite of the Apple. Shares move near correction territory, weighing on suppliers, on a report the tech titan is asking them to scale back shipments of iPhone Ten parts. Meanwhile the AfD is dealing with a split at the top, following co-leader Frauke Petry's surprise move to refuse to sit with the far-right party when it enters the Bundestag. Moody's has downgraded the UK's credit rating to AA2 and changed its outlook from negative to stable. It said weakening public finances and eroding economic strength following Brexit were to blame. Moody's added it was no longer confident that Britain would be able to secure a free trade deal with the EU that would make up for the damage from Brexit. We'll close the blog there. Thanks for reading.